On May 5, 1950, the Rodgers and Hammerstein musical South Pacific captured the Pulitzer Prize in Drama. This would receive special attention in the Arkansas Gazette. The reason this carried such weight in Arkansas was that the musical had a connection to Little Rock. The 1950 Pulitzer for Drama went to a musical, for only the second time in the history of the awards. The recipient was South Pacific by Richard Rodgers, Oscar Hammerstein II and Joshua Logan. The character was the leading lady of Nellie Forbush. She was an Navy ensign and a nurse stationed on an exotic island during World War II. The musical was based on a Pulitzer Prize winning novel, James Michener’s Tales of the South Pacific. In the Michener novel, Miss Forbush is not from Little Rock. She is actually from a small town in Alabama. But the book does mention Nellie and her mother visiting Little Rock. The part was written for Mary Martin from Weatherford, Texas. Rodgers, Hammerstein & Logan did not discuss why they relocated Nellie’s birthplace. Originally the musical contained a song entitled “My Girl Back Home” in which Nellie sang of being from “Little Rock, A-R-K” while another character sang of being from “Philadelphia, P-A” and “Princeton, N-J.” It is possible the change to Little Rock was made because it offered more lyrical possibilities, but that is only a supposition on the part of the Culture Vulture. That song did appear in the movie version in which Mitzi Gaynor played Nellie Forbush. It was also featured in the 2008 Broadway revival, this time with Kelli O’Hara playing Nellie. In the musical, Nellie struggles with her own prejudices. This issue of prejudice became an instance of fact meeting fiction. In 1957, a few weeks after Eisenhower sent troops into Little Rock to ensure that Central High would be desegregated, a production of South Pacific on Long Island was temporarily halted when the audience booed and yelled after Nellie mentioned she was from Little Rock. Interestingly, the movie was released in 1958, but retained references to Little Rock. That was either a testament to the expense of re-editing it, or the fact that audience reaction had lessened. In the Michener novel, Miss Forbush is not from Little Rock. She is actually from a small town in Alabama. The part was written for Mary Martin from Weatherford, Texas. Rodgers, Hammerstein & Logan did not discuss why they relocated Nellie’s birthplace. 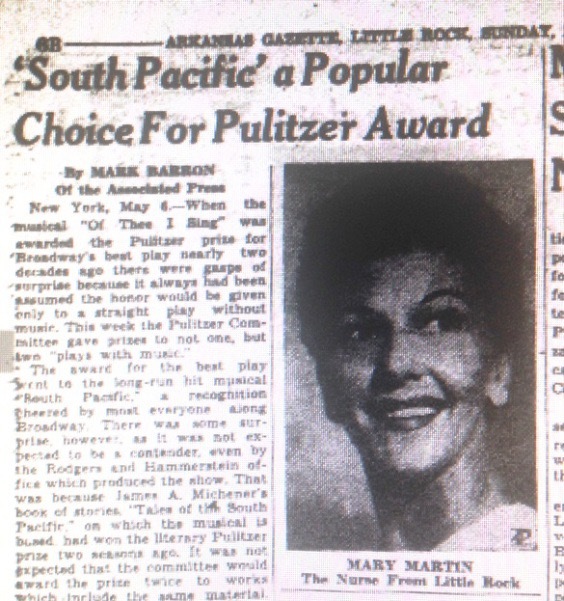 On May 6, 1950, the Associated Press ran a story which would later be carried in the Arkansas Gazette about the Rodgers and Hammerstein musical South Pacific capturing the Pulitzer Prize in Drama. The reason this carried such weight in Arkansas was that the musical had a connection to Little Rock.